Mayline, Sorrento Collection, Dimensions: 72"W x 39"D x 45"H; Weight: 481 lbs. 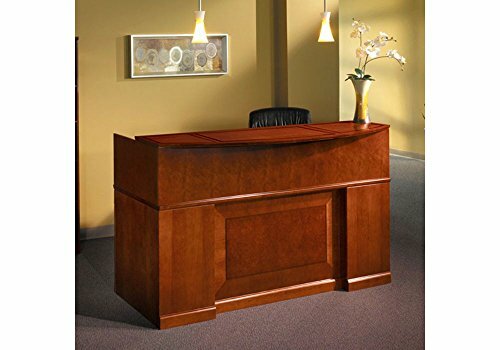 Sorrento series reception desk by Mayline is constructed of AA-grade North American hardwood solids and veneers, with a 14-step handcrafted finishing process that includes two coats of catalyzed lacquer for clarity and heat and stain resistance; Reception desk features a center drawer, a pencil drawer, a box drawer, and three letter/legal file drawers. File drawers have full extension ball bearing slides, and all drawers (except center drawer) lock for security; Desk includes steel threaded leveling glides for uneven floors. Meets or exceeds ANSI/BIFMA and ISTA standards; Drawer pedestals ship fully assembled, all other pieces ship ready to assemble.